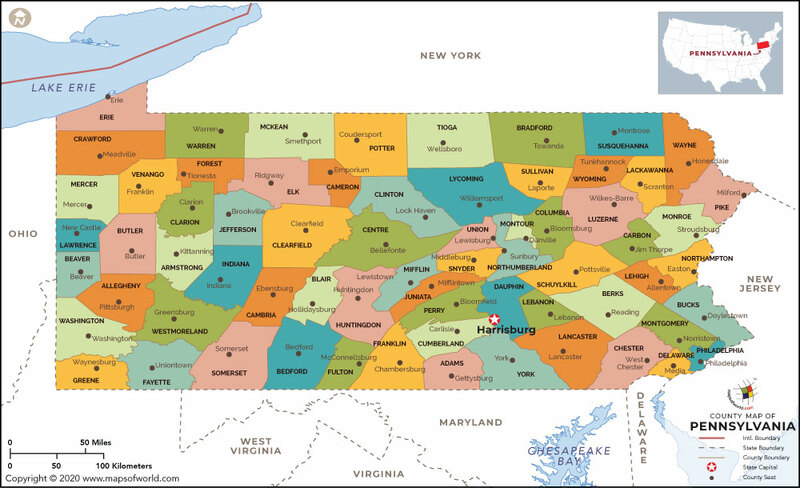 Pennsylvania is home to 67 counties, of which the ten most populated ones are located in the south-eastern region of the state. The FIPS or Federal Information Processing Standard is a unique process implemented by the US government to identify various counties. These codes are five-digit numbers, completed with a three-digit county code. Located in the Mid-Atlantic and North-eastern areas of the US as well Great Lakes area, Pennsylvania is bordered by Maryland to the south, New Jersey to the east, Canada, Ontario, and Lake Erie to the northwest, and West Virginia to the southwest. In terms of population, this state holds the ninth rank amongst the fifty other states in the United States. With Harrisburg as the capital, the state is also home to some of the most populous cities including Erie, Allentown, Pittsburgh, and Philadelphia. Venango County : Located in the western region of the state, Venango is stretched across 675 square miles. Founded in 1800, the county lies halfway between Erie and Pittsburg and is home to twenty townships and nine boroughs. With an approximate population of 54,984 the county holds the 42nd rank amongst the 67 counties. The top attractions of this county are DeBence Antique Music World, Drake Well Museum, Oil Creek State Park, Clear Creek State Forest, and Cornplanter State Forest. The top universities and colleges in Venango County are Clarion University of Pennsylvania and DuBois Business College. Chester County : Chester County was founded by William Penn in 1682 and is considered to be the highest income county of the state. The county is equally popular among both business professionals and residents and holds an approximate population of 498,886. So, while business professionals can eye on this destination for their business deals, visitors can spend a good time relaxing at the rural setting. The county houses a varied range of attractions including National forest lands and state parks. Besides, you can also enjoy activities like swimming, fishing and hiking here. Some of the noted universities and colleges in Chester County include Immaculata University, Lincoln University (Pennsylvania), Penn State Great Valley School of Graduate Professional Studies, Valley Forge Christian College, and West Chester University of Pennsylvania. Allegheny County : With an approximate population of 1.3 million, this county holds the second rank amongst the 67 counties. Founded on 24 September 1788 and located centrally in the MidAtlantic states, this county is located at a short distance from New York, Washington DC, Atlanta, and Toronto. The county is also noted for its scenic landscapes including river valleys and plenty of opportunities for skiers. The top colleges and universities in Allegheny County are The Art Institute of Pittsburgh, Chatham University, Penn State Greater Allegheny, Robert Morris University, University of Pittsburgh, to name a few. Bucks County : As per the records of 2010 census, the Bucks County holds an approximate population of 625,249. And in terms of population, the county holds the fourth rank amongst the 67 counties. The county is bordered by the Delaware River to the east. Some of the major attractions of this county are the Bucks County Wine Trail or the cobblestone roads of Peddler’s Village. Besides, some other attractions that are worth noting include The County Theater, Fonthill, Mercer Museum, Bucks County Playhouse, Ringing Rocks County Park, Moravian Tile and Pottery Works, Nockamixon State Park to name a few. The county is also home to some of major universities and colleges such as Bristol College, Pennco Tech, Bucks County Community College, and Cairn University. Delaware County : Delaware County is also referred to as Delco and holds an approximate population of 558,979 as per the records of 2010 census. In fact, this population makes it the fifth populous county amongst the remaining. On 26 September 1789, the eastern portion got carved out from the main Chester County as a separate county and since then it got its present name, Delaware. The county has about 49 municipalities. Some of the major attractions that are worth visiting when here are Brandywine Battlefield Historic Site, Colonial Pennsylvania Plantation, Ridley Creek State Park, and Longwood Gardens to name a few. Those eyeing higher education in this county can go for options like Cheyney University of Pennsylvania, Neumann University, Delaware County Community College, Haverford College, to name a few.